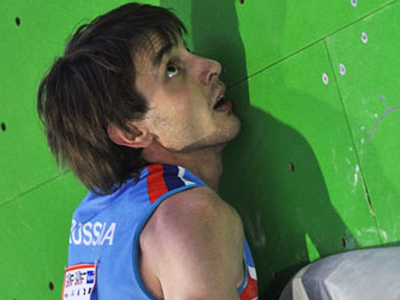 Dmitry Sharafutdinov has proven he is top of the pile at the Rockstar bouldering event in Austria. The Russian kept his best for last beating local star Kilian Fischhuber in the final head-to-head battle. ­Forty-seven athletes from 14 countries have fought it out in a brand new format of the Rockstar competition, with the top six men and women making the finals. There they had to climb two boulders, one after another. Three athletes then advanced to the super final to take on a third even more difficult obstacle. 1,500 climbing fans from around the world who came to watch the event got to see a world first – two competitors climbing an identical route at the same time on a “super boulder,” but out of sight of each other. In order to finish “on top”, the athletes had to stand with both feet on the boulder and press a buzzer. The super final saw reigning world champion, Dmitry Sharafutdinov of Russia, taking on the reigning World Cup holder, Austrian Kilian Fischhuber. The local hero missed his last move and had to start from the bottom, while his Russian opponent grabbed his chance and won the head-to-head battle, claiming the title in the men’s competition. “I’m very happy because this competition is the best competition in my life,” the champ said. “I saw Dmitry going right for it. I waited a bit longer and actually I managed to catch up with the champ in the first try. And I thought OK that’s right, I’m going to do it, but then this long reach move was too far for me in the first try and my victory ran down the river and he did it ahead of me,” Kilian Fischhuber commented. In the women’s super final it was Anna Stöhr of Austria who took top honors. The double world champion easily beat American Alex Puccio, who made a mistake and fell.